Ford has revealed its latest in-car entertainment and control systems, with its new MyFord tech including the option to have Twitter feeds read to drivers. Ford's new technology will first appear in Edge and Focus model cars in the next 12 to 18 months, with the auto manufacturer promising Tweeting behind the wheel in a year's time. MyFord includes two 4.2-inch LCD screens on either side of the speedometer, an 8-inch touch screen in the dash and a five-way button steering wheel control to give the driver more control over the heating and air conditioning system, entertainment system, navigation system and mobile phone. 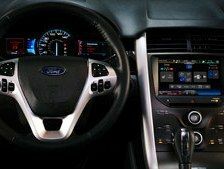 "With MyFord driver connect technology, we realized we weren't necessarily competing with other automakers, but we were really redefining how customers interacted with their cars," said Jim Buczkowski, Ford director of electronics and electrical Systems Engineering. "What the mouse did for the PC, we need to create for the automobile," Buczkowski told the Wall Street Journal. "The first version of Sync was impressive, but this blows the doors off," added Carey Butler, VP of professional engineering services at in-car mobile tech specialists Bsquare. However, safety campaigners have been quick to jump on the news as yet further evidence that new technologies are driving us to dangerous levels of distraction in the car. Ford and other in-car tech specialists have, in response, claimed that listening to Twitter feeds and text messages and the like being read out to you is considerably safer that looking at a screen to read them while doing 100mph on the outside lane of the M1. Doug VanDagens, Ford's global director of connected services, told CNN that people read Twitter feeds and send text messages while they're driving and that Ford is only trying to make those activities safer. "We take what people do -- they talk on the phone, they fumble with mp3 players, they look at maps. We take these activities and make them safer," he said. Christie Hype, a spokeswoman for AAA, was quick to hit back, noting: "The more things that are going on in a vehicle, the more things can distract a driver…You only have so much attention to give, and we really want everyone to keep their attention on the roadway for safety reasons." More study of the tweeting by voice while driving would need to take place to make an absolute determination as to what effect Ford's announcement will have on distracted driving, she said. As previously reported, Ford's new tech will also generate a Wi-Fi hot spot in the car to let passengers and (presumably, parked) drivers get online in the vehicle. The Twitter-reading function works with an app called Open Beak. Ford's new in-car tech will also let you play internet radio via Pandora's mobile app.